At CoverMyMeds, we’re privileged to have access to the brilliant minds of the women we have on staff; however, it’s important to recognize there are women in health care IT across the industry, digging in and doing incredible work to help patients. One such individual we have the honor of working with is Stacy Hopkins, Senior Product Manager at RelayHealth, a company that is making incredible strides to connect industry stakeholders across the board through innovative technology centering around patients. Stacy’s tenacity and passion for patient care has helped take products from ideas to meaningful execution. We sat down with her to chat a bit about her career, the work she’s doing building products for patients and her (spot-on) advice for women in the industry. CoverMyMeds: Hi, Stacy! Thank you chatting with us. Patients and patient care via health care IT is a subject in which our two companies (CoverMyMeds and Relay Health) are aligned and care about. Can you talk a bit about how you came to be in the field? What led you to RelayHealth? Stacy Hopkins: Thanks for having me! We equally admire the work your company is doing and everything we’re doing together to help patients. My career in health care IT started while I was in college. I was a full-time student at Georgia State University, majoring in finance. I was referred by my mother and was hired to work in the call center for what was NDCHealth before we were purchased by Per-Se Technologies and then McKesson. At first, it was just a job while in college, but I quickly began to see how impactful the company I worked for was when interacting with pharmacies. The calls I would take helped pharmacists understand editing of transactions and assisted in providing a clarification that could remove barriers to access for patients. I became intrigued by health care and how emerging technology was playing such a crucial part in how patients actually got their prescriptions. I never knew all of these things happened on the back-end. After I graduated I became a financial analyst with the same company — at that point I knew that I wanted to grow in the health care industry. I was knowledgeable about the core platform of our business from my support days, and to see the business from a finance perspective, the sky seemed to be the limit. I knew I wanted to learn more about health care from different angles of the business. In finance, diversifying your portfolio was always a topic of how a business could be successful in the long term; however, if it worked in finance, why not diversify my own personal career portfolio? Fast forward to today: I have held different positions at RelayHealth from managing our implementation team, to managing the program for our risk evaluation and mitigation strategies (REMS) platforms, to product management. CoverMyMeds: That’s an admirable career path! Can you talk about your current position at RelayHealth? What are some interesting and impactful things you’re working on? 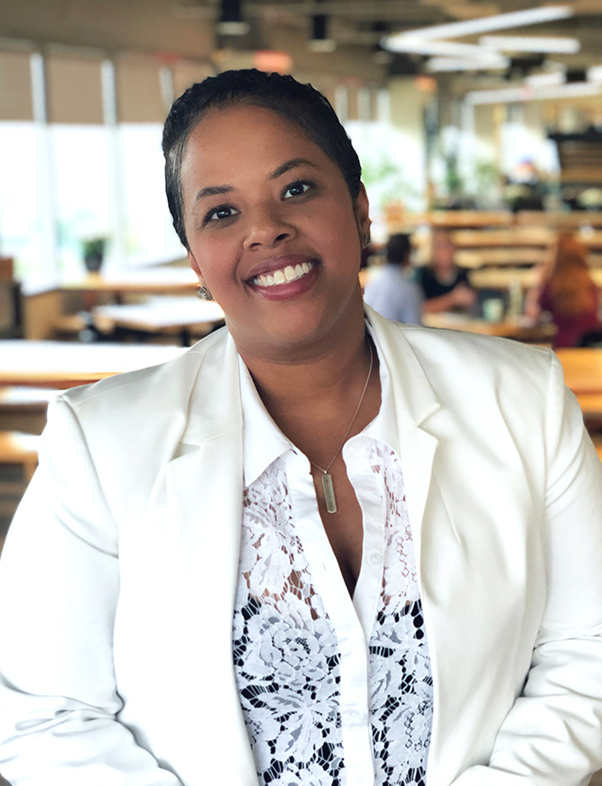 Stacy Hopkins: In product management, my greatest accomplishment has been taking a concept and leading the on-going efforts of building our RxBenefit Clarity platform. I say platform because it has morphed from the development of another product to a platform that has the ability to connect the entire health care system with one common denominator: the patient. The solution is providing a path that creates an opportunity for all stakeholders in health care to come together and change the industry as we know it today. The amount of opportunities that are generated are paramount, and this will continue with the power of the RelayHealth and CoverMyMeds network. CoverMyMeds: You’ve done great work. What are some challenges you face being a woman working in technology? Stacy Hopkins: The biggest challenge that I was able to overcome was having a voice and commanding that it is heard. As a woman in health care, we have the tendency to lack dominancy or we don’t command ownership of a room or meeting even when we know we are the expert. I had to learn that a woman’s voice is equally as powerful and it has the ability to be more powerful than ever. I owned my truth and I owned my growth; therefore, I don’t second guess myself and I don’t have to be spoken to in order to speak up in a meeting or at a conference. CoverMyMeds: What advice do you have for the next generation of women who might consider a career in health care IT, or technology in general? Stacy Hopkins: My advice to anyone entering health care IT is to turn your nurturing behavior and the need to help into something far greater than just than just an act of kindness. Use that same passion to generate new ideas and be as innovative as possible. Don’t wait for an opportunity to be granted and don’t expect that all you have to do is good work and your time will come. It takes more than doing just a good job all the time, it takes your voice to brand yourself. Once you properly brand yourself, you will notice that your organization will yearn for your opinion and make strategic advancements in the business based upon your level of knowledge. Growth is not always just organic, but in a lot of ways it is strategic and bold.